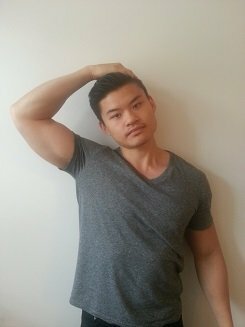 Welcome to my ultimate guide to Neck Strengthening Exercises for neck pain! Does it feel like it’s not getting any better? … Or perhaps it’s even getting worse? … then this post is for you! I would love to share with you the exact neck strengthening exercises that have worked both for myself as well as many of my neck pain suffering patients. I am certain they can help you too! Like what you’re reading? : Get more blog posts like this by joining our mailing list! // Why do you need to do neck strengthening exercises? The only way your neck issues are going to improve is that if you actually decide to do something about it. Pain is not normal. It is a sign that your body isn’t working at its best. These neck strengthening exercises are designed to help you address the factors that may be causing your neck pain. // Are neck strengthening exercises dangerous? No – the neck strengthening exercises are designed to be gentle and safe. If you are unsure whether or not you should be doing them, please consult your local health practitioner prior commencing any exercises. There are certain conditions such as cervical stenosis, nerve impingement, disc bulges, instability, vascular issues, arthritis (just to name a few), which may possibly get worse if you over do the exercises. Do what you are capable for doing, assess how you respond to them and progress the neck strengthening exercises as appropriate. // How often do I need to do them? But as a general guideline, I would advise to aim for at least 2/week as a minimum. Just take it easy for the first few days as it may take some time for your neck to get accustomed to the neck strengthening exercises. WARNING : These neck exercises are to be conducted in a gentle and safe way. They must not cause any sharp pain, dizziness or headaches. Period. I have divided this section into 6 different levels of difficulty. Make sure you are able to perform all of the exercises comfortably before proceeding to the next level of neck strengthening exercises. It is designed this way as to minimize the chance of performing an exercise that is outside your capabilities. Before you start any of the neck strengthening exercises, it is important that any tight neck structures are released to decrease stiffness. Any build up of tension may make it difficult for you to perform the exercises properly. Keep in mind: You will find certain spots that are quite tender to touch. These are generally the tight muscles you should be targeting! Keep at it! These neck muscles are located at the front/side of your neck. Although these muscles seem to rarely be the painful spots that people complain of, they are definitely common drivers of pain all around the neck region. Locate the muscle using a pinch grip (see above for location). Gently apply pressure between your thumb and index finger. Move up and down the side of the neck to cover all areas. Duration: 1 minute per side. These muscles are usually the main areas people with neck pain point to when I ask them “where does it hurt?”. They are situated at the back of the neck/shoulder region and often subject to overload. Apply pressure to the upper trapezius and levator scapula region. Spend at least 1-2 minutes doing this to both sides. Situated at the base of the skull, these muscles are usually way over worked in individuals with bad posture (see post: Poked neck posture). These muscles are usually the ones responsible for headaches. Whilst lying down, place a ball underneath the base of the skull. Apply a gentle pressure into the ball. Move your head around to target different tight areas. Several muscles in the neck attached into the 1st rib of the rib cage. If the 1st rib does not move properly, the connecting neck tissues will also not move properly which can lead to stiffness/pain/overactivity of muscles. Firmly pull the strap in a downwards direction. Do not tilt your torso. Make sure only your head is moving. Duration: 1 minute to both sides. This level comprises of neck exercises which involve moving the neck through its normal movements. This is an important step as obtaining normal movement will be the beginning of the healing process. Remember – take your movements as far as you can go without reproducing any pain. 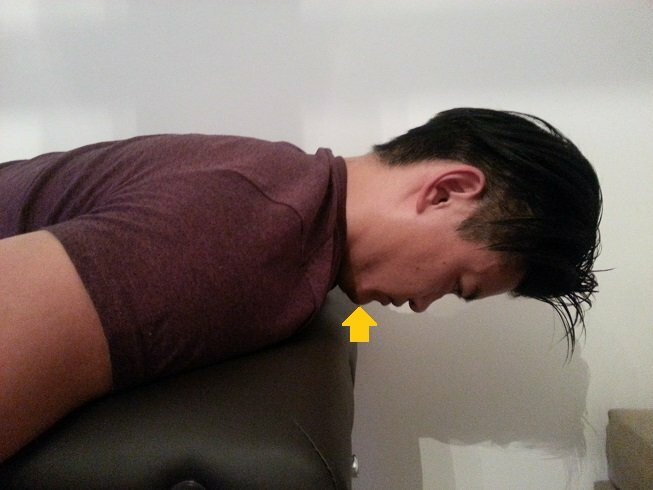 Note: This chin tuck position is the starting position for all of your Level 2 neck strengthening exercises. Whilst sitting upright, gently tuck your chin in. Also known as “making a double chin”. Make sure to keep your jaw and neck muscles relaxed. Slowly look all the way up, then slowly look all the way down. 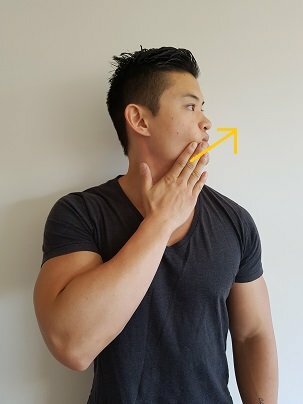 Make sure that your chin does NOT jut out throughout the exercise. Look all the way left/right. Make sure that you do not allow your chin to jut forward at the end of the movement. Gentle tuck you chin in. Tilt your neck from side-to-side. 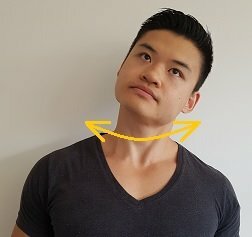 Whilst keeping your neck as relaxed as possible, draw a circle with your neck. NOTE: Make sure you feel the stretch where you are meant to. If you do not feel a stretch with these neck exercises, then it is likely that you are not stretching anything! Whilst sitting upright, gently tuck your chin in and look down. Place your hand at the back of your head and apply a downward pressure. Aim to feel a stretch at the back of your neck. Whilst sitting upright, tilt your head to the side (Ear to the shoulder). Place your hand on the side of your head and apply a gentle pressure. Whilst sitting upright, look towards your armpit. 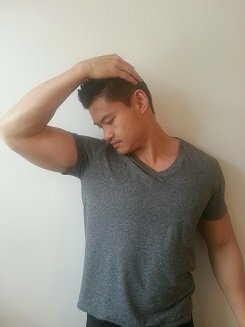 Place your hand on the back of your head and apply a downward pressure towards the armpit direction. To increase the stretch, point your lower arm down to the floor to depress your shoulder. Aim to feel a stretch on the side/back of your neck. Whilst sitting upright, look up and rotate your head to the side. Place your hand on the collar bone on the opposite side to which you have rotated to. Pull the skin on the collar bone downwards. Aim to feel a stretch at the front/side of your neck. Whilst sitting upright, turn your head all the way to one side. 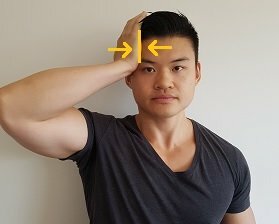 Place your hand at side of your head and apply pressure. Whilst lying on your back, tuck your chin in. Place your hands at the front of your chin and apply a downward pressure. Level 4: Strengthen the Deep neck flexors! This exercise is designed to strengthen the muscles that are responsible for placing your head and neck into the correct position. Whilst lying down on your back, tuck your chin in. Whilst keeping the chin tucked, gently nod and hold your chin towards your chest. Be sure to keep the neck muscles are relaxed as possible. Whilst lying down on your back, tuck and hold your chin in. Gently pull your head off the floor. You can use your hands to help you if required. Whilst keeping your chin tucked in throughout, slowly lower head back to floor. Be sure to keep neck muscles are relaxed as possible. 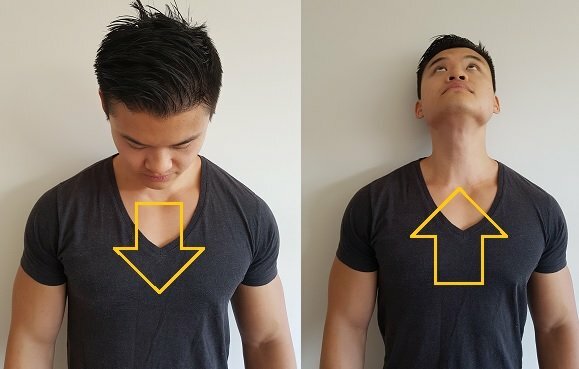 Level 1-4 neck exercises are a complete waste if you have no strength/endurance to maintain a good position of your neck. Additionally – Strong muscles will allow the neck to tolerate much more load and stress. Whilst sitting upright, place your palm on the side of your head. Gently turn your head into the hand. Match the force of your hand. Whilst sitting upright, place your palm on side of your head. Gently tilt your head into your hand. Support your forehead on a rolled up towel. Gently tuck your chin in as to slightly lift your forehead off the towel. Lie face down on a bench with your head off the side. Whilst keeping your chin tucked in, lift your head up to a leveled position. Comfortably lie on your side with your head supported by a pillow. Gently lift head of pillow. This level involves dealing with your neck pain and treating it more wholistically. Since all of the structures on your body are connected to each other in one way or another, they all influence each other. Did you know: The source of your neck pain may actually be coming from structures that aren’t even located in the neck. It means that if you find that these neck exercises have not cured your neck pain, then you will need to search other areas of your posture that may be causing your issues. You can do all these valuable neck strengthening exercises… and they will certainly work for most, but there may be some of you who may just have to look a bit deeper to find the pain generator. … But – that’s why this website exists! I would like to offer you the other solutions that you may not have already thought of! Please feel free to ask me a question down below in the comments section if you are unsure of anything! Hi Mark, Thank you so much for these exercises. I have neck pain, stiffness, and weakness from whiplash from an accident almost 5 months ago. I’ve seen General Doc, Orthopedic, Chiro, PT,massage, and Neurologist. Had MRI and X-ray and they say it’s normal and problem is “muscular” (myofacial). When I do a lot of stretching especially rotation left and right, I am in bad pain for 3 days. When I do exercises like some rows, planks, etc… including some of the above exercises- done for 3-4 days again and is such discomfort I can’t sleep. Question is: do I need to toughen up and fight through the discomfort and pain and keep doing it or back off. When I get too much rest it gets stiff and weak. I can’t win. Any advice would be greatly appreciated. If the scans rule out any serious issues (nerve, fractures etc), and it is indeed just a muscular issue, I would try to power through the exercises. Keep in mind, you may have some SENSITISATION occurring in your structures which may explain why you feel sore for days after exercises. My advice would be to persist with your exercises, do what you can/don’t do what you can’t do yet, keep progressing as often as you can tolerate and stay active. Hi Mark. My neck is extremely tight. Coukd this be contributing to problems with my jaw? It locks shut and my mouth openong is very small. The masseters are very tight and feel overworked. 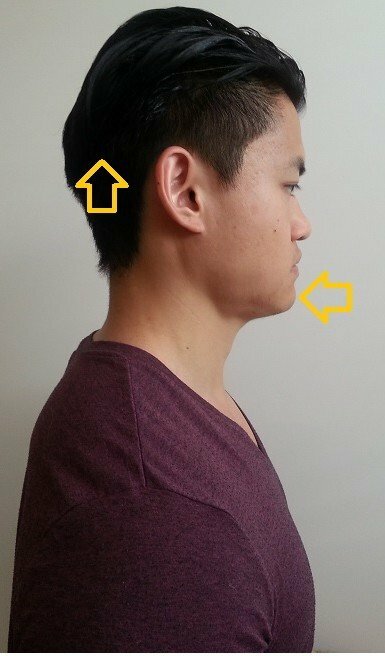 Originally I thought the issue was with the jaw but could they be overworking and compensating for my weak, thin and tight neck? I wonder whether focusing on strengthening and loosening the neck will fix my jaw. 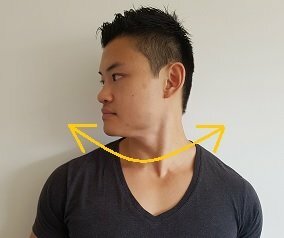 Jaw clenching can be a sign that you are compensating for weakness somewhere else in your body (esp. the neck). Try releasing (dig your fingers into the masseter) and stretching (pull your jaw downwards with your fingers on your teeth of the bottom jaw) to get some relief. 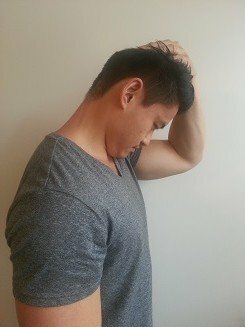 Follow up with some neck strengthening exercises (namely forward head posture exercises) and see how it goes in the next few weeks. On top of that – make sure you address any activities or positions that you may be adopting on a regular basis that may be compounding the issue. Hi Mark! Thank you for your wonderful blog. I am a yoga teacher and have suggested your blog to a number of my students. I’m guessing you disagree. I would love to know your thoughts. Neck circles are awesome! … provided that the neck is able to tolerate them. This exercise is designed to take the neck into its normal full range of motion. If you don’t aim to train your full range of motion (pain-free), then you will never reclaim the full movement of a joint. 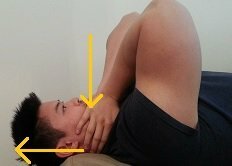 Some people with forward head posture may need to ease off the combined movements of full extension/rotation to avoid compression of the joints. hi mark! Im your one of fan Rabia. so, this case is I have neck strain on today morning. I can’t move head to left side. then Can I do these neck exercises you taught ? 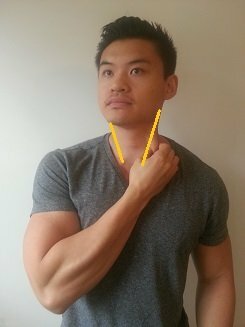 How can i do for my neck on today? If your neck is in a lot of pain right now, I would focus on just gentle range of motion exercises. Stay away from any spikes in pain. 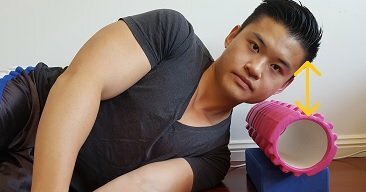 I haven’t specifically given exercises to strengthen the omohyoid muscle. However – with poor positioning of this muscle secondary to poor posture, its function can definitely be influenced. Or even worse – it can be recruited to do a movement that is not meant to do! But to answer your question, the stretches to the front and side of the neck will also include this muscle. I get dizzy the day after I go for long road bike rides. I think it has something to do with the flexion of my neck on the bike. It’s the only thing that sets it off. I have raised my handle bars to a more upright position and I’m no longer getting the tweaky neck pain I used to feel after rides. Although, after long rides I still get dizzy. When I say dizzy it’s not vertigo. It’s the sensation of brain fog, feeling off equilibrium, tired and irritated eyes. 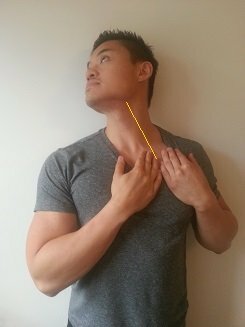 What neck stretches and strenghinging exercises do you recommend I focus on for this and when should I do these exercises? I have a 100 mile century I’m training for so stop riding is not what I like to hear :-). Thanks Mark! I really appreciate all this info you provide. With cycling, it is common to have your neck in a hyper extended position to see the road in front of you. This can jam up your neck joints and muscles at the back of your neck. This area can be associated with dizziness, eye pain, headache etc when tight/overloaded. You will need to stretch and release the area first. Follow up with Deep neck flexor strengthening. Hi Mark I have a 9mm tear in the supraspinatus tendon and physio & needling not helping. I am to see orthopaedic specialist in 6 weeks, but really don’t want an op as they don’t seem to be successful. Am seeing a Prolozone (PRP treatment possibly) Doctor tomorrow. 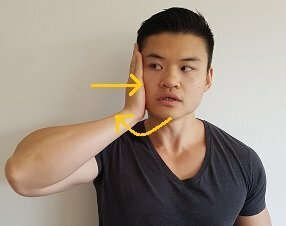 Can you suggest my best way forward and if exercises will help/repair tear. The position that is painful is putting my left arm outward against the wall and to put my left arm behind my back and upwards. I am 66 yrs old & do quite physical upper body work. I can lift my arms above my head easily enough. Any comments would be much appreciated. I have a blog post here for you: Shoulder impingement. It’s not specifically on supraspinatus tears, but you might find the content helpful! Really like your posts, very informative. I work on my posture a lot, but still sometimes have trouble getting my head to release to the floor when attempting to lie on my back. It feels like the tightness is in my trapezius muscles more than my neck. Can you suggest any excercises to release the tightness and what may be causing it? Do you mean you are unable to get your neck towards the floor? If so – make sure you are keeping your hip and knees bent. This will take away the arch in your lower back, which then may allow your neck to reach the floor. You will need to focus on stretching/releasing the muscles at the back of the neck. Hi mark.I suggest placing a pdf file for each post, especially neck and gluteal muscle training. I had a concussion a half year ago, and i assume whiplash as well, since then i have had troubles with my neck and posture. i worked on my posture, and after a while i think i’ve gotten over most of the postural issues. what could be causing this, and how can i get it to stop tightening up, because this happens throughout the day even though i keep good posture, i was told that it’s not from whiplash and so i’ve been trying to solve this problem, i’ve gotten a massotherapist to work on my neck, i’ve tried releasing it and stretching it, but the same issue arises that it tightens back up again. 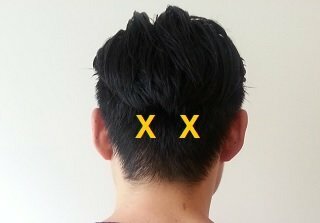 i have one suspicion of what it could be at the moment but i wanted your opinion on if you think this is a possibility and how i could solve it, i was thinking this could this be due to weak suboccipital / (semi) spinalis capitus etc, because in the past six monthes i’ve been very reluctant to look up at all, like say to look straight up at a bird or plane flying, or when i bend over to pick something up and lift head up to see something, because it makes the suboccipitals tighten up and then i have to go through the process to release them again, could it be that they are actually weak, and this is causing the muscles to tighten up whenever i use them, and if so and how would i go up about strengthening these muscles that let me look up? 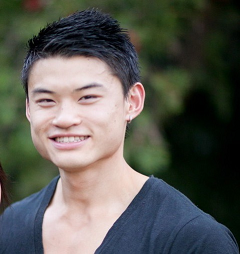 The first thing I would check out is if you have a forward head posture. This head position forces the sub-occipital muscles to be over active. If you do not have a forward head posture, then you may be right in saying that these muscles are weak. A good way to strengthening them is to do the strengthening exercises as mentioned on the forward head posture post. What is a good position to be in to read? I find this to be the chain cause of my neck problems and it only enhances my dowangers hump. Thank you for all of the information you are providing! It is most helpful. I personally change positions quite frequently when reading a book. Keep moving! You will benefit from focusing on stretching and releasing your SCM first. This will neurologically reduce the muscular tension in the SCM. Until you can activate your DNF without SCM, you should not progress to the other more difficult exercises. PRO TIP: as you perform a chin tuck, gently push your tongue to the top of your palate. This will help turn off your SCM. Your neck exercise have 5 levels. Are we suppose to do level 1 for say a month before moving on to level 2 and so on OR are we doing all 5 levels each time? You can do whatever works for you. It depends on the condition of your neck really. I personally would recommend doing all of them if possible. How many repetitions for the one with the video (b) Retraction with deep neck flexor activation (progression))? Thanks for sharing all this valuable info! As many are your neck will allow you! But if you want a number, aim for 5. Dear mark, I have had three neck surgeries. They were all fusions. My neck is very locked, and the pain is never ending. I also have bad posture, I cannot seem to correct it. 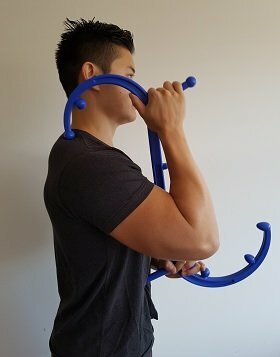 Do you sell a tool I can use to force my body to the correct posture? 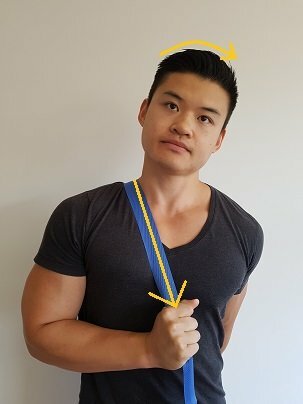 Something that will help me to know when my posture is correct. I am in desperate need of help. I cut hair, and that work promotes bad posture. Please help, I’m desperate for help. If you have had fusions in the neck (especially at multiple levels), then your movement will definitely be limited. Make sure you be consistent with the neck exercises. It can take some time to correct your posture, but remember you have also had your bad posture for a long time as well. Consistency and patience is the key here. There are certain things that can “force you into correct posture” like Posture Shirts, taping, posture braces… however, if used in the long term, will make your postural muscles even weaker. Great exercises, big variety, many of them I seen for first time. I have and other programs for neck etc, but many of yours are unique. Great job, keep on moving.